A resplendent Mary Magdalene, wearing a fur-lined cloak and holding her attribute, a jar of ointment, stands on tiles decorated with letters from her name. 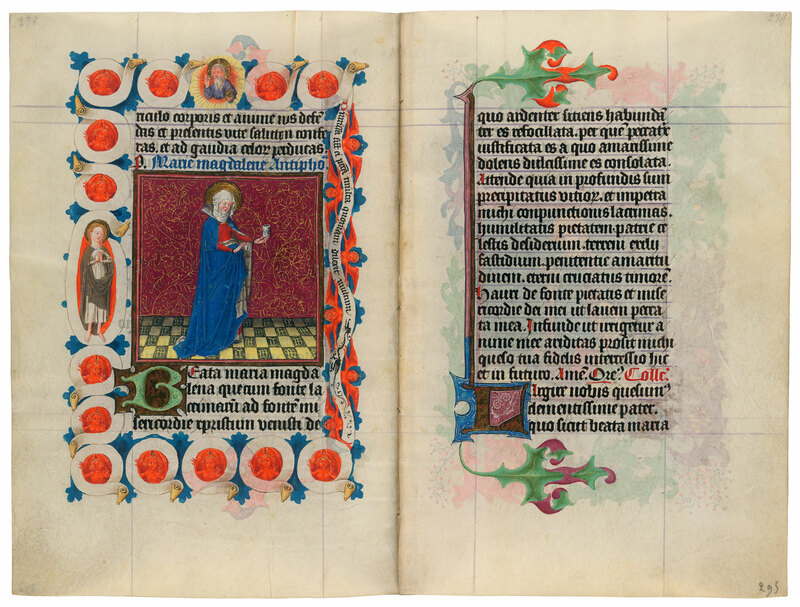 A shabbier version of the saint appears in the left margin, accompanied by angels and blue sky and blessed by God in the top margin. The border alludes to ecstasies the Magdalene enjoyed at the end of her life, when, during her meditations, angels lifted her into the sky. The text on the scroll at the right (from Luke 7:47) explains that Christ forgave her many sins because she loved so much. Suffrages are short prayers to individual saints. As protectors of medieval people, saints were their doctor in plague, their midwife at childbirth, their guardian when traveling, and their nurse during toothache. If the Virgin was the figure to whom one addressed the all-important petition for eternal salvation, it was from saints that one sought more basic or temporal kinds of help. While the Virgin became, as the Mother of God, almost a goddess herself, saints retained more of their humanity and thus their approachability.